A Blue Ray DVD or Blu-ray disc is a high definition optical disc format that appeared in the spring of 2006. It is a disc that competed with the HD-DVD for the high definition optical disc market and eventually won the format war. This format is now the only optical disc format of CD or DVD size for high definition video use. There are many manufacturers and companies backing this format, the most notable are Sony and Philips. The trademark spelling is Blu-ray, although it is often also referred to as Blue Ray. A single layer Blu-ray DVD has a capacity of 25 GB, which is a five times greater storage capacity than a single layer standard DVD. This greater storage capacity makes it ideal for the storage of high definition television video and the storage of large amounts of digital information. For very large digital scrapbook projects that require large amounts of digital scrapbooking storage (such as those that include HD video), this may be the only format of choice in the optical disc world. Like the HD-DVD, the Blu Ray disc requires the use of a blue laser at a wavelength of 405 nm in order to read the disc and record the disc. However, unlike the HD-DVD the Blue Ray disc has a different disc structure. Whereas the HD-DVD physical structure is very similar to the DVD format, the Blu-ray DVD structure is completely different. This was a bit of a problem for manufacturers initially because they could not use existing DVD manufacturing facilities. In order to be able to manufacture Blue Ray DVDs, new equipment and several adjustments needed to be made within the factories. This slowed the introduction of the disc compared to the HD-DVD because in order to produce HD-DVDs, very little adjustments needed to be made. However, once manufacturing facilities were ready and the Sony PlayStation 3 was introduced (which contained a Blu-ray drive) sales of equipment and Blue Ray optical discs spiked considerably and this combined with other factors led to the demise of HD-DVD. Like the other 12 cm or 4.75 inch optical disc formats (CD, DVD, and HD-DVD), the Blue Ray DVD comes in a variety of different formats. The read-only formats are the Blu-ray movie disc for Hollywood movies and Blu-ray ROM disc for software distribution, games, etc. The record once disc for recording HDTV and storage of digital files of all types is the BD-R or Blue Ray recordable disc. Finally, an erasable Blu-ray disc is available and is known as BD-RE. Although this can also be used for digital scrapbooking storage media, erasable discs of all types, not just the BD-RE, are generally intended to be recorded, erased, and reused and not for the longer term storage of digital information. 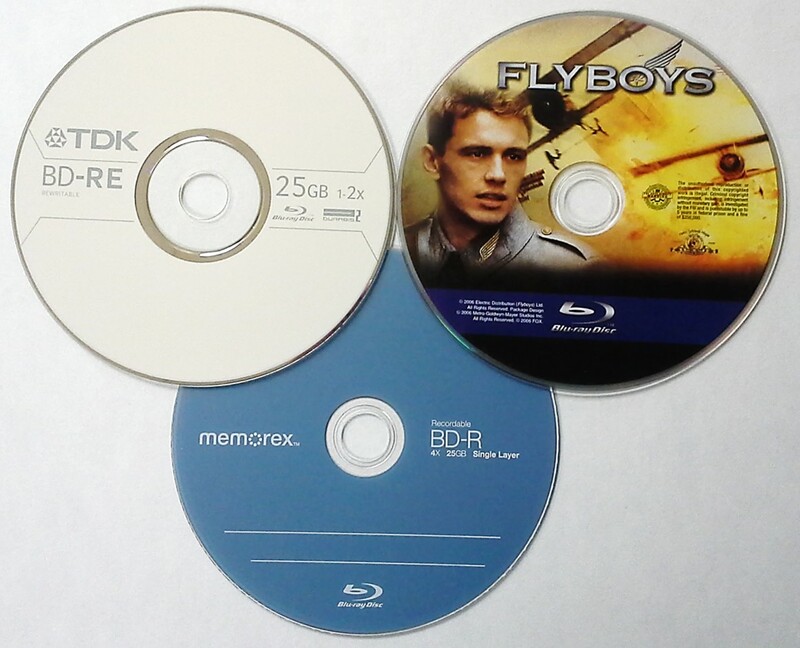 A picture of these three different types of Blue Ray DVD formats is provided below. The storage and handling of Blu-ray discs is similar to other optical discs such as CDs and DVDs. Although there is no standard, information on the proper storage of Blu-ray media can be found at the Blu-ray media storage conditions link. The Blue Ray Movie Releases page is a way of staying on top of the many new releases that occur every month. Instead of searching the internet to find such releases, this page provides this information in one location.